This painting is usually associated with a description of the Lord Mayor's Water procession watched from the 'leads' (that is roof) of Whitehall Palace by Charles II and James, Duke of York, on 29 October 1683. The King can be seen with hat and star of the Garter on the roof in the background. 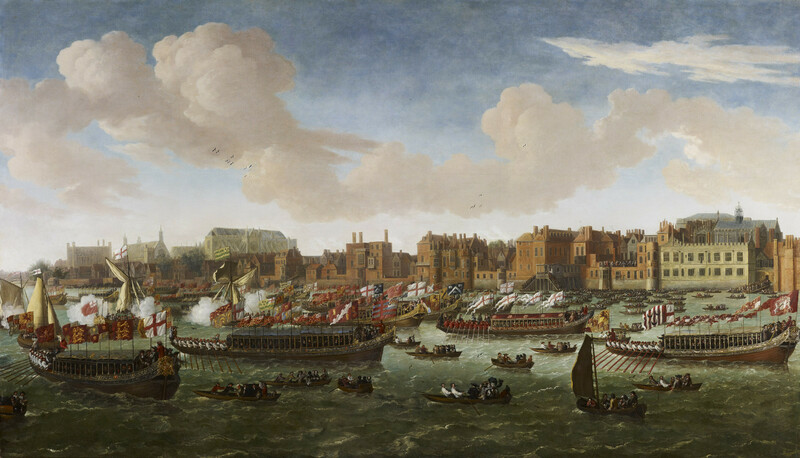 This painting offers an excellent view of the water front of Whitehall Palace before the rebuilding of the Queen's Apartments by Wren in the reign of James II and before the whole palace was burnt down in 1698, with the exception of the Banqueting House (which still stands and the roof of which is visible here to the right). Westminster Abbey and Hall are visible in the distance to the left. We can also see the barges of the City of London and the various livery companies: Fishmongers, Vintners, Goldsmiths, Mercers, Skinners and Weavers can all be recognised. More will probably be identified in the future. The author of this charming view is anonymous but would seem to be a proficient artist, probably from the Low Countries: the way in view our view shows a jumble of boats superimposed upon each other suggests an artist used to observing the actual appearance of things rather than making diagrammatic versions of reality.